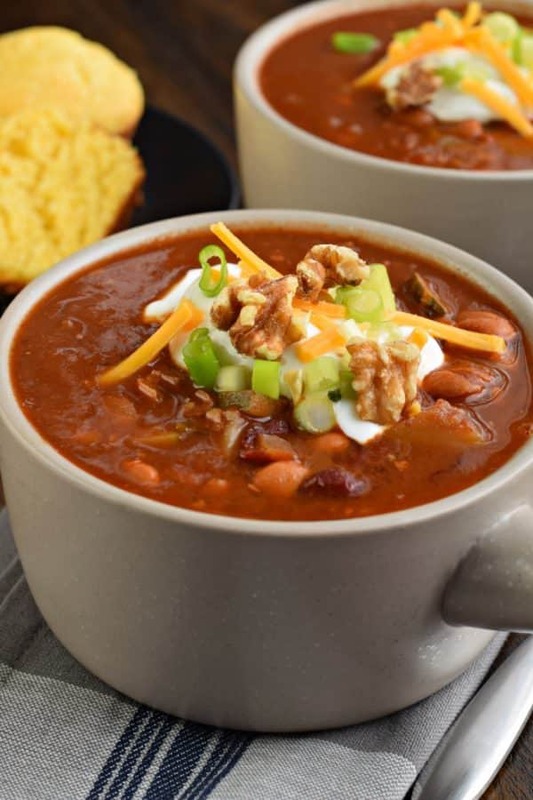 Hearty Vegetarian Chili recipe packed with flavor! 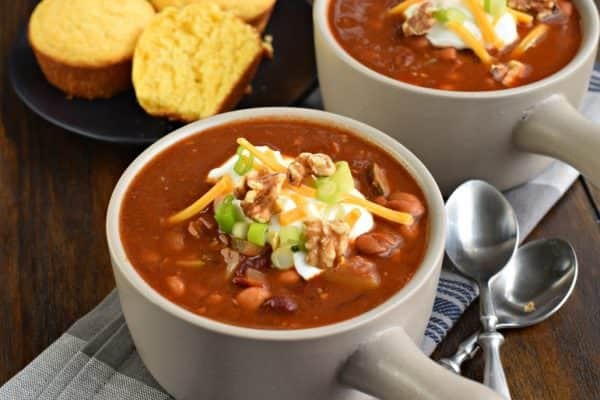 You won’t miss the meat in this vegetable chili, and the addition of walnuts gives the perfect texture and flavor! March madness is here!!! In my mind that means two birthdays, spring break, and yardwork. I know nothing of this college basketball type of madness, haha! 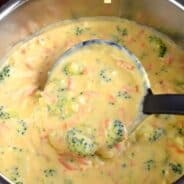 So recently I gave up eating meat for Lent, and while I don’t necessarily crave it, I do have a lot to learn with cooking vegetarian. Plus, this mom needs protein. I started CrossFit nearly 6 months ago and my muscles need protein, so I’m told! It’s easy to get protein when you are eating meat. But it’s taking me more effort to make sure I’m getting enough through legumes, eggs, and other non-meat foods. One of my favorite ways to get a little extra protein is nuts. Fortunately, I have an ambassadorship with Fisher Nuts, which means there is never a shortage of almonds, walnuts, and pecans in my house. They are a perfect preservative free, non GMO, heart healthy snack! 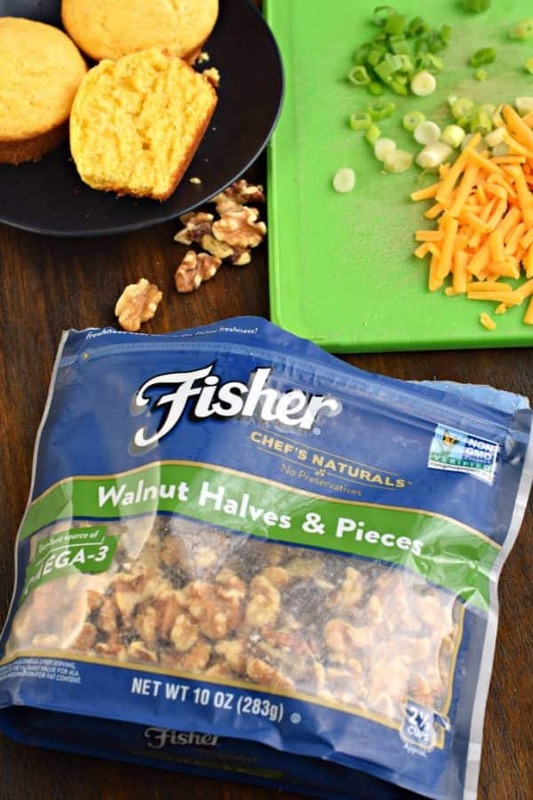 And, Fisher Nuts come in resealable bags, which makes them even more convenient (and fresh) for on the go snacking! In my quest to get more protein in my diet, I had this idea to add walnuts to a vegetarian chili. And, you guys, it turned out even better than expected. I loved the texture the nuts provided! Because they cooked with the vegetables and sauce, they weren’t “crunchy” but they still had a snap to them when you took a bite! And the nutty flavor was perfect paired with the beans and vegetables! 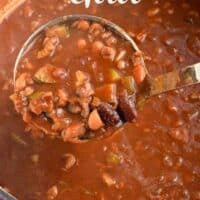 So, for your March Madness party (or after a day of yardwork, haha) whip up a big pot of this Vegetarian Chili. Even the meat lovers in your house will eat a big bowl! Question is, what do you top it with? 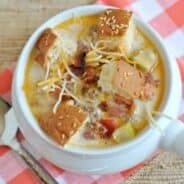 For me, I love a good dollop of Greek yogurt (instead of sour cream), some green onions, cheddar cheese, and a couple of walnut pieces to give the crunch! 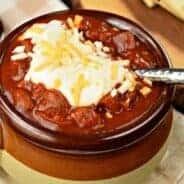 Hearty Vegetarian Chili recipe packed with flavor! 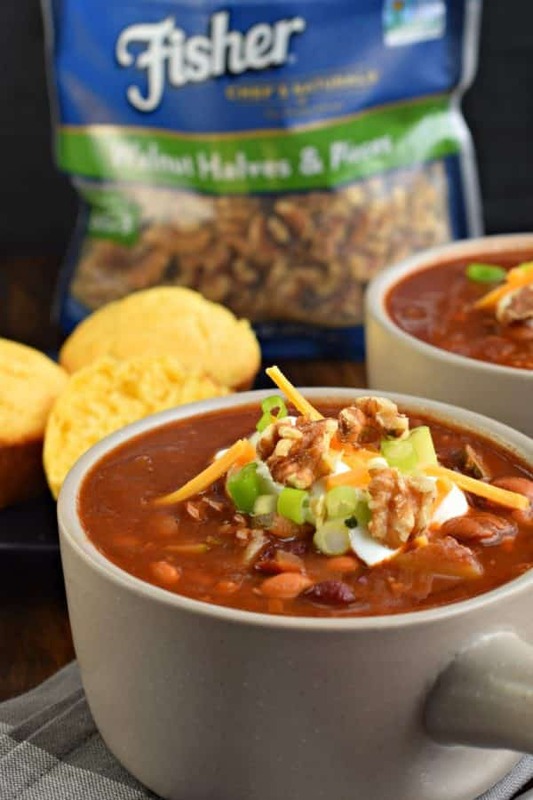 You won't miss the meat in this vegetable chili, and the addition of walnuts gives the perfect texture and flavor! In a large stock pot, heat olive oil over medium high heat. Add zucchini, onion, green pepper, and garlic. Saute for about 3-5 minutes, until softened. Add in remaining ingredients (except garnish options). Stir and cover. Reduce heat to low and simmer for 90 minutes, stirring occasionally. Serve with desired garnishes. ENJOY! I’ve been adding nuts to everything these days – soups, salads, lots of different pestos, and desserts. 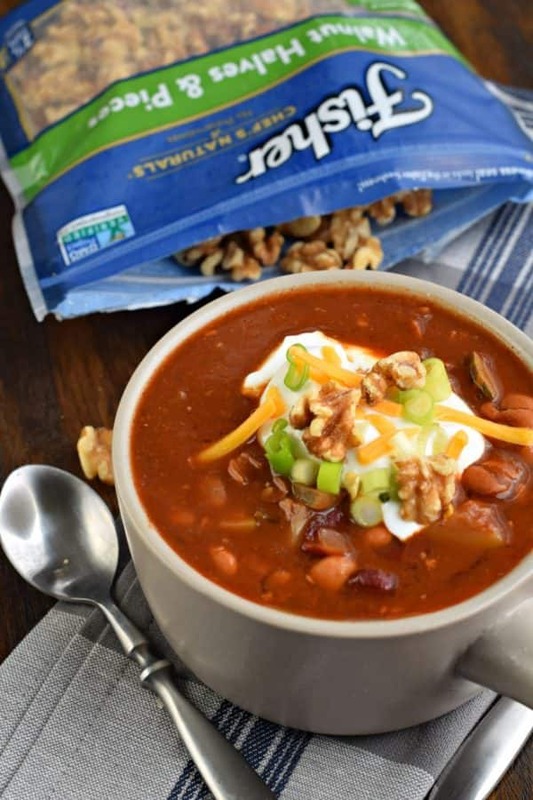 I love the idea of nuts in chili. Giving this one a try very soon! 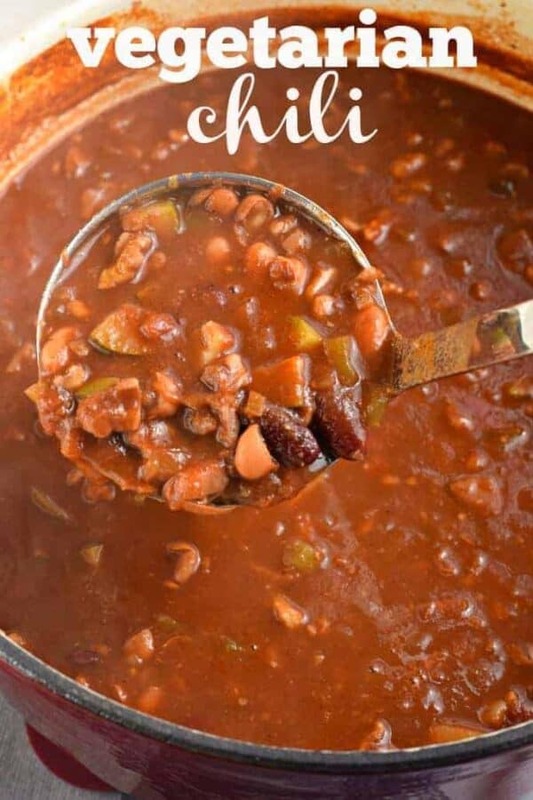 I could sure use a bowl of this right about now, Aimee 🙂 Love the addition of nuts in chili…a thought that had never crossed my mind but it looks absolutely wonderful! It is so good, and I love the little bit of texture from the nuts! I am not seeing the suggested quantity of walnuts to add to this recipe. Is it 1 cup and do you suggest whole walnuts or walnut pieces? Thanks. 1 cup of walnuts. I chop them up, not too fine, not too coarse.